50 Fun & Interesting Wedding Facts! 1. Hey, brides, tuck a sugar cube into your glove — according to Greek culture, the sugar will sweeten your union. 2. The English believe a spider found in a wedding dress means good luck. Yikes! 3. In English tradition, Wednesday is considered the “best day” to marry, although Monday is for wealth and Tuesday is for health. 4. The groom carries the bride across the threshold to bravely protect her from evil spirits lurking below. 5. Saturday is the unluckiest wedding day, according to English folklore. Funny — it’s the most popular day of the week to marry! 6. Ancient Romans studied pig entrails to determine the luckiest time to marry. 7. Rain on your wedding day is actually considered good luck, according to Hindu tradition! 8. For good luck, Egyptian women pinch the bride on her wedding day. Ouch! 9. Middle Eastern brides paint henna on their hands and feet to protect themselves from the evil eye. 10. Peas are thrown at Czech newlyweds instead of rice. 11. A Swedish bride puts a silver coin from her father and a gold coin from her mother in each shoe to ensure that she’ll never do without. 12. A Finnish bride traditionally went door-to-door collecting gifts in a pillowcase, accompanied by an older married man who represented long marriage. 13. Moroccan women take a milk bath to purify themselves before their wedding ceremony. 14. In Holland, a pine tree is planted outside the newlyweds’ home as a symbol of fertility and luck. 15. Engagement and wedding rings are worn on the fourth finger of the left hand because it was once thought that a vein in that finger led directly to the heart. 16. About 70 percent of all brides sport the traditional diamond on the fourth finger of their left hand. 17. Priscilla Presley’s engagement ring was a whopping three and a half-carat rock surrounded by a detachable row of smaller diamonds. 18. Diamonds set in gold or silver became popular as betrothal rings among wealthy Venetians toward the end of the fifteenth century. 19. In the symbolic language of jewels, a sapphire in a wedding ring means marital happiness. 20. A pearl engagement ring is said to be bad luck because its shape echoes that of a tear. 21. One of history’s earliest engagement rings was given to Princess Mary, daughter of Henry VIII. She was two years old at the time. 22. Seventeen tons of gold are made into wedding rings each year in the United States! 23. Snake rings dotted with ruby eyes were popular wedding bands in Victorian England — the coils winding into a circle symbolized eternity. 24. Aquamarine represents marital harmony and is said to ensure a long, happy marriage. 25. Queen Victoria started the Western world’s white wedding dress trend in 1840 — before then, brides simply wore their best dress. 26. In Asia, wearing robes with embroidered cranes symbolizes fidelity for the length of a marriage. 27. Ancient Greeks and Romans thought the veil protected the bride from evil spirits. Brides have worn veils ever since. 28. On her wedding day, Grace Kelly wore a dress with a bodice made from beautiful 125-year-old lace. 29. Of course, Jackie Kennedy’s bridesmaids were far from frumpy. She chose pink silk faille and red satin gowns created by African-American designer Ann Lowe (also the creator of Jackie’s dress). 30. In Japan, white was always the color of choice for bridal ensembles — long before Queen Victoria popularized it in the Western world. 31. Most expensive wedding ever? The marriage of Sheik Rashid Bin Saeed Al Maktoum’s son to Princess Salama in Dubai in May 1981. The price tag? $44 million. 32. In Korea, brides don bright hues of red and yellow to take their vows. 33. Brides carry or wear “something old” on their wedding day to symbolize continuity with the past. 34. In Denmark, brides and grooms traditionally cross-dressed to confuse evil spirits! 35. The “something blue” in a bridal ensemble symbolizes purity, fidelity, and love. 36. In Egypt, the bride’s family traditionally does all the cooking for a week after the wedding, so the couple can…relax. 37. In South Africa, the parents of both bride and groom traditionally carried fire from their hearths to light a new fire in the newlyweds’ hearth. 38. The tradition of a wedding cake comes from ancient Rome, where revelers broke a loaf of bread over a bride’s head for fertility’s sake. 39. The custom of tiered cakes emerged from a game where the bride and groom attempted to kiss over an ever-higher cake without knocking it over. 40. Queen Victoria’s wedding cake weighed a whopping 300 pounds. 41. Legend says single women will dream of their future husbands if they sleep with a slice of groom’s cake under their pillows. 42. An old wives’ tale: If the younger of two sisters marries first, the older sister must dance barefoot at the wedding or risk never landing a husband. 43. 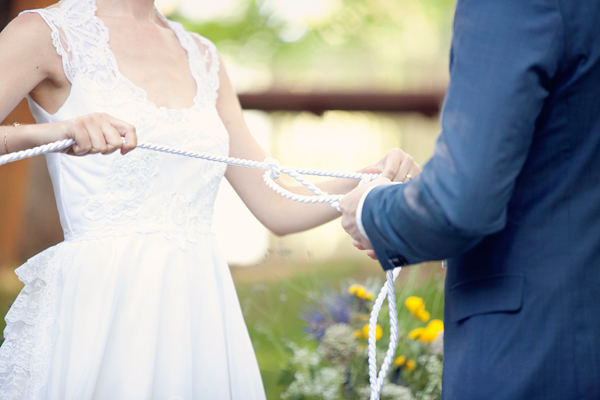 In many cultures around the world — including Celtic, Hindu and Egyptian weddings — the hands of a bride and groom are literally tied together to demonstrate the couple’s commitment to each other and their new bond as a married couple (giving us the popular phrase “tying the knot”). 44. The Roman goddess Juno rules over marriage, the hearth, and childbirth, hence the popularity of June weddings. 45. Princess Victoria established the tradition of playing Wagner’s “Bridal Chorus” during her wedding processional in 1858. 46. The bride stands to the groom’s left during a Christian ceremony, because in bygone days the groom needed his right hand free to fight off other suitors. 47. On average, 7,000 couples marry each day in the United States. 48. Valentine’s Day and New Year’s Eve are the two busiest “marriage” days in Las Vegas — elopement central! 49. The Catholic tradition of “posting the banns” to announce a marriage originated as a way to ensure the bride and groom were not related. 50. Stag parties were first held by ancient Spartan soldiers, who kissed their bachelor days goodbye with a raucous party.